For years I have been using an A5 notepad to record my observations and sketches. This simple approach has a number of shortcomings. Older pages suffer from wear and tear as they are repeatedly exposed to dew and dust; I have nowhere to put down the variety of pencils I use; and I end up holding a red light and the notepad in my other hand while sketching. I definitely need to be an octopus! Also, my preprinted information such as comet finder charts, an observing list, tend to get lost or suffer in the dew. In my other hobby, I use a pilot’s kneeboard to plan a route, write down instructions from air traffic and store checklists and reference cards that I need while busy aviating, navigating and communicating. A clipboard on the front so I can make a sketch or write up notes. I will cut some plastic sheet so that they can be protected from dew. 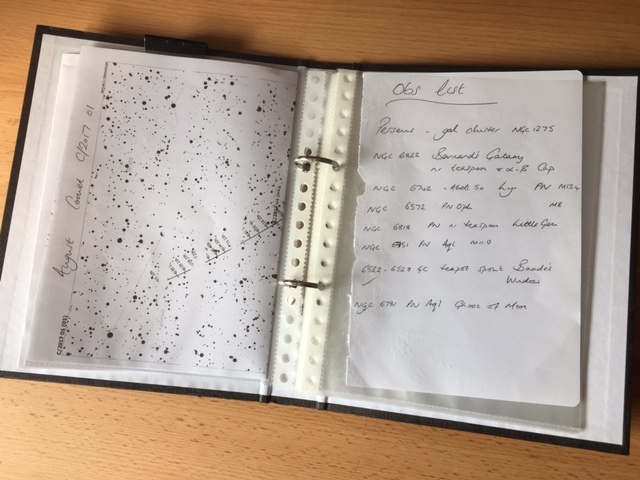 Laminated pouches inside the folder to store completed sketches, spare notepaper and other useful information I might need to refer to at the eyepiece (eg comet finder charts and an observing list). Finally, I have ordered some clips so I can have 6 pencils to hand without needing to keep fishing them out of my pockets. First few uses have shown it works well. It’s really useful having everything in one place and protected from the environment. 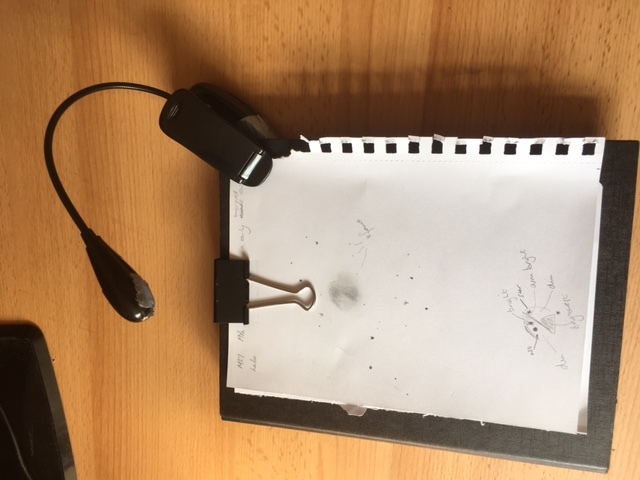 I can just grab the journal and I know I have my blank observing forms, finder charts, observing lists and sketching kit are all to hand. 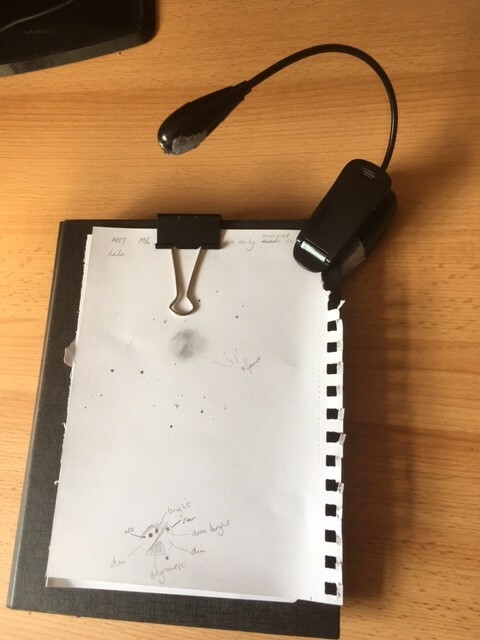 It is also much more comfortable for sketching / writing notes as there’s no need to hold a flashlight, notebook and pencil. I am now thinking of getting a nice version made – perhaps with some art work on the front cover.